Goat Leg Coffee Table. Custom coffee table. Pompeii table. 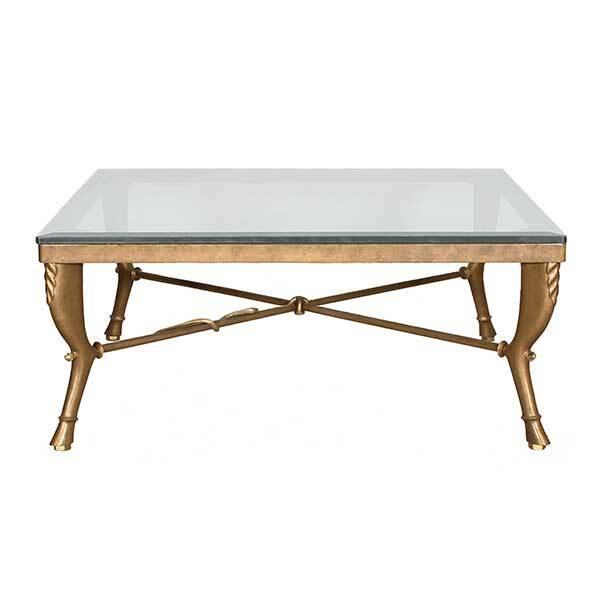 Furnishings of ancient Rome were the source of inspiration for the Goat Leg Coffee Table. The most important record of furniture of the Roman period is the collection of carbonized furniture from Herculaneum. While the eruption of Vesuvius in 79 CE. was tremendously destructive to the region, the hot liquid lava that engulfed the town of Herculaneum ultimately preserved the furniture in carbonized form. Tables with animal legs seemed to be in vogue at the time as several such tables have been found. The Goat Leg Coffee Table was designed by Shah Gilani, ASFD. The base is offered with multiple top options including glass, stone, and wood. Robust metal construction allows the base to support a heavy top without shaking. Serpent accent on the stretcher may be deleted upon request. Four polished bronze glides are provided which also serve as levelers – a useful feature when the floor is uneven. Custom sizing is available. The table base is offered in a variety of finishes. In addition to our standard product line, we specialize in designing and manufacturing custom furniture and lighting for high end residential and hospitality projects. We make drawings and prepare finish samples for client approval.